Reginald Heber was born in the area of Cheshire, England, on April 21, 1783. of scholarly and well-to-do parents. At the age of seventeen he entered Oxford University, where his scholarship and literary abilities received much attention. Following his ordination to the ministry of the Anglican Church, he served for the next sixteen years at an obscure parish church in the little village of Hodnet in western England. Throughout his ministry he was known and respected as a man of rare refinement and noble Christian character. Heber was also noted as a prolific literary writer, making frequent contributions to magazines with his poetry, essays and hymns. In 1823, just three years before his early death at the age of forty-three, Heber was sent to India to serve as the Bishop of Calcutta. This responsibility included not only India but the Island of Ceylon and all of Australia as well. The pressures of this work along with the humid climate of that area wore heavily upon his health. One Sunday morning, after preaching to a large outdoor crowd of Indians on the subject of the evils of their caste system, he evidently suffered a sun-stroke and died very suddenly. One year after his untimely death, a collection of his fifty-seven choice hymns was published by his widow and many friends. Most of these hymns are still in use today. 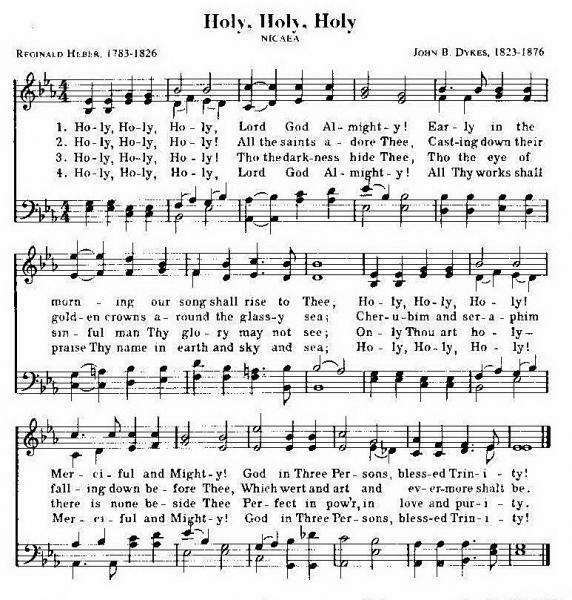 This hymn was written by Reginald Heber specifically for its liturgical use on Trinity Sunday, which occurs eight weeks after Easter. The emphasis of this Sunday's service is to reaffirm the doctrine of the triune Godhead. Though the word "trinity" is not found in the Scriptures, yet the truth of three Persons, equal and eternal with each other, is clearly taught throughout God's Word. Reginald Heber is also the author of the hymn, "From Greenland's Icy Mountains" (No. 25). The tune for this test has been named “Nicaea.'' It was named after the Council of Nicaea held in Asia Minor in 325 A.D., when the doctrine of the Trinity was examined and held to be a true and essential doctrine of the Christian faith. In 1861 this tune was composed specifically for these words by one of England's leading church musicians of the nineteenth century. Dr. John Bacchus Dykes. This popular composer has contributed more than 300 hymn tunes; most of them are still in use today. Other hymns by John B, Dykes include "I Heard the Voice of Jesus Say" (No. 35), "Jesus, the Very Thought of Thee" (No. 49), "Eternal Father, Strong to Save" (101 More Hymn Stories, No. 22), and "O For a Closer Walk With God" (ibid., No. 67).